MEOS 2019 was concluded successfully on 21st of March 2019, with an all-time attendance record of more than 10200 registered attendees! We are pleased to announce that CPG contributed to the success of MEOS 2019 by having a strong presence with 15 technical papers and 15 ePosters presented. 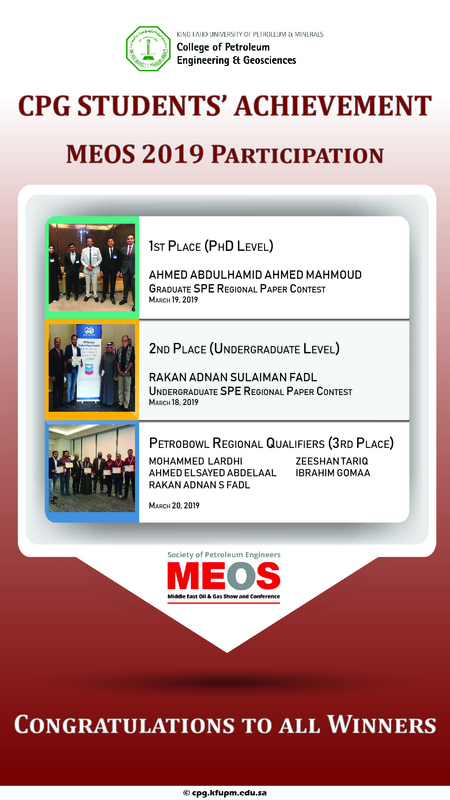 Our students also did exceptionally well by winning the 1st place in the SPE Regional Student Paper Contest for the Ph.D. category, 2nd place for the undergraduate category and winning & qualifying to the international SPE PetroBowl Competition. Also, we had a strong contribution to the Technical Program Committee and the Executive Committee of the event as well as co-chairing several technical sessions and committees. It goes without saying, that our booth this year was a big attraction with new elegant design and content!